This step lets you to define the format of backup filename. Backup makes sense when performing it periodically. 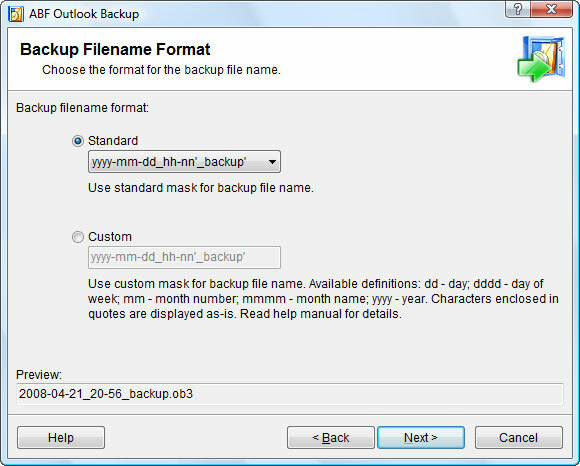 This option allows to define filename according to the date and time backup was made. Figure 13. Backup filename format. Displays the date using the Short date format in your Windows Regional Options followed by the time using the format given by the Windows Time format. The time is not displayed if the date-time value indicates midnight precisely. Displays the date using the Short date format in your Windows Regional Options. Displays the date using the Long date format in your Windows Regional Options. Displays the time using the Short time format in your Windows Regional Options. Displays the time using the Long time format in your Windows Regional Options. Uses the 12-hour clock for the preceding h or hh specifier, and displays the contents of the Time AM symbol for any hour before noon, and the contents of the Time AM symbol for any hour after noon.